Colorectal cancer, often referred to as colon cancer, is the second leading cause of cancer-related deaths in the United States, but it doesn't have to be. This disease is largely preventable and highly curable with recommended colon cancer screening. 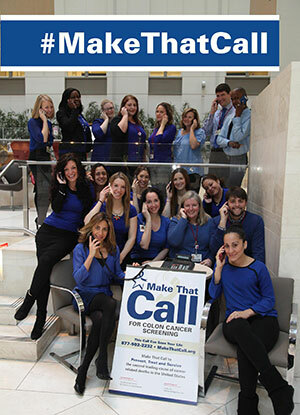 Make That Call for Colon Cancer Screening is a health education campaign from NewYork-Presbyterian aimed at increasing cancer screening of at-risk populations, while also communicating with those not yet due for screening about ways to lower their colon cancer risk. If you are age 45 or older, we urge you to Make That Call* to your doctor today to schedule an appointment for colon cancer screening. If you are younger than 45 but have risk factors that increase your risk for colorectal cancer, Make That Call* to your doctor to discuss screening at a younger age. *Not all insurance plans provide coverage for colonoscopies for patients under the age of 50. Please check with your insurance provider. Early colon cancer often has no symptoms at all. When present, symptoms may include rectal bleeding, change in bowel habits, narrowing of the stool, cramping pain in the abdomen, fatigue, or unexplained weight loss. If you have symptoms, please see your doctor promptly for evaluation and diagnosis. Screening refers to testing that is done before symptoms are present. These tests allow the detection of early colon cancer when it is highly curable, as well as the detection of growths, called polyps, which can turn into cancer. In removing a pre-cancerous polyp, colon cancer can often be prevented. Computed tomographic (CT) colonography (virtual colonoscopy) every 5 years. Stool DNA test with high sensitivity for cancer, every 3 years. According to the New York City Department of Health and Mental Hygiene, colonoscopy is the preferred colon cancer screening test. A colonoscopy allows for the detection and removal of pre-cancerous polyps and identification of early cancers during a single examination. However, not everyone is able to receive a colonoscopy, sometimes due to medical or other reasons. The best test is the one that gets done. Subscribe to Advances, NYP’s newsletter containing health news and helpful tips for patients. Follow NewYork-Presbyterian on Twitter, Facebook, YouTube, and Instagram for cancer facts and health tips.